When I found out we were expecting a little girl this past spring, I immediately started daydreaming of a sweet feminine space where her imagination would flourish. I like rooms that evoke a certain feeling when you walk in them, and for her nursery, I wanted that to be a feeling of calm. Inspired by the most beautiful swan mobile, I picked a color scheme of pale pink, white, chambray blue with a touch of gold for her nursery. From there her whole room came together into the perfect little space for our sweet Isla. With cute baby clothes and accessories being one of my favorite parts of girl mom life, I wanted to be sure they were on display in her room. 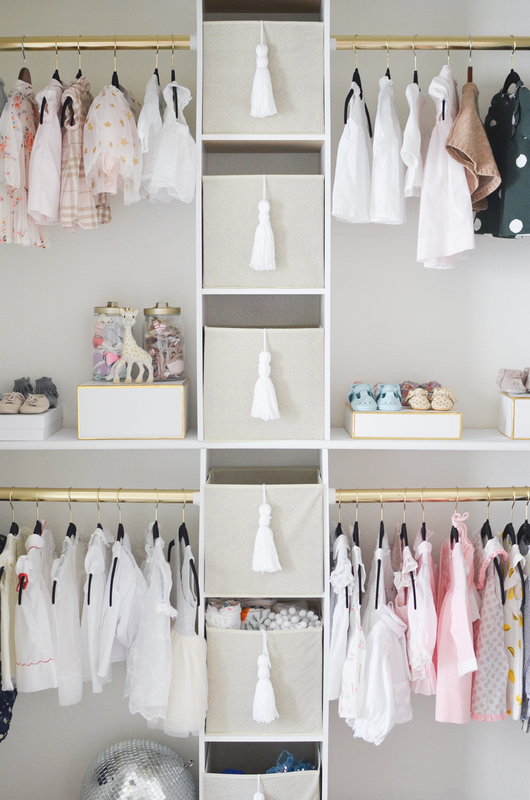 From storing moccasins on the shelves above her changing table to hanging a sweet dress from a hook on her wall to the DIY open closet—her wardrobe has become the perfect décor for her nursery. One of my favorite pieces in her room is the custom painting from artist Anna Swanson of Demi and Olive. 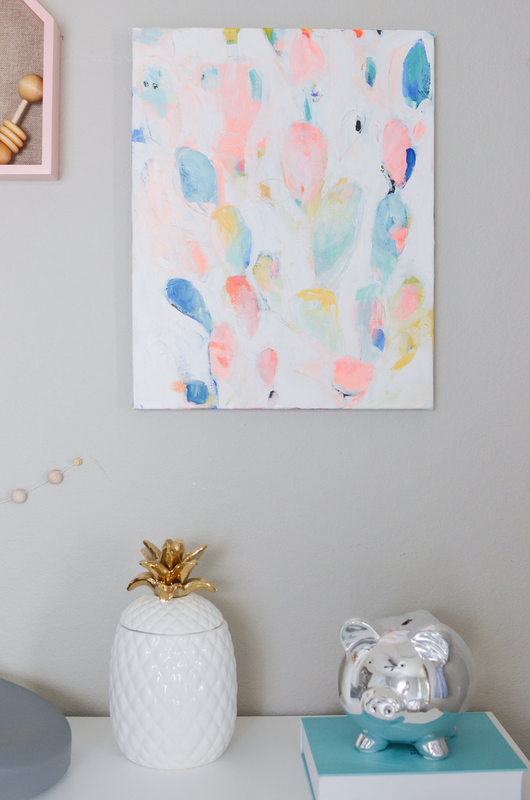 The painting was one of the finishing touches to her nursery, and it added the perfect pop of color and fun. Living in Arizona, I love the abstract cactus inspiration behind the painting—a little ode to our home sweet home. It makes me smile every time I see it. I wanted to be sure her space was useable. We kept the middle of the room open with a beautiful pom pom rug that has been the perfect spot for tummy time and reading books together with her big brother. I can picture her twirling around her room as she gets older playing dress-up with her little friends. What a sweet sight it will be! Creating a space for a new baby is one of my favorite parts of pregnancy and postpartum. I hope our little Isla treasures her room as much as we do. I am sharing more pictures of her nursery and details over on Momma Society.